Nonobese diabetic (NOD) mice, a model for type I diabetes (TID), have reduced numbers of invariant Vα14Jα18 TCR α-chain-positive natural T (iNKT) cells that do not release IL-4 in response to in vivo activation through their Ag receptor. The deficit in iNKT cell number and function is implicated in immune dysregulation and the etiology of TID. Therefore, we reasoned that the genetic determinant(s) that controls iNKT cell number and function might lie within Idd (insulin-dependent diabetes susceptibility locus) regions, which are known to contain TID resistance or susceptibility genes. A systematic analysis of iNKT cell number and function in Idd congenic mice revealed that neither iNKT cell number nor their inability to rapidly secrete IL-4 in response to acute in vivo activation by Ag underlies the mechanism of protection from diabetes in Idd congenic mice. Moreover, the regulation of iNKT cell number and function appears to be under the control of several genes. The most notable of these map to the Idd4, Idd5, Idd9.1, and Idd13 regions of the mouse genome. Together these findings provide a clue to the genetic mechanism(s) underlying iNKT cell deficiency in NOD mice. Human autoimmune type I diabetes (TID)3 insulin-dependent diabetes mellitus) is characterized by leukocytic infiltration of the pancreata, followed by specific immune destruction of the β cells of the islets of Langerhans. This human disease is best represented in nonobese diabetic (NOD) mice. NOD’s genome predisposes the females of this strain to spontaneous development of TID. Introgression of co-isogenic chromosomal segments from resistant strains into NOD or vice versa has led to the identification of ∼20 diabetogenic (Idd) loci, revealing the polygenic nature of the disease (see reviews in Ref. 1). Of the numerous Idd loci, Idd1 is the best understood. It localizes to the H2g7 region, the MHC of NOD mice (2, 3, 4, 5, 6). Pathogenic H2g7-restricted CD4+ and CD8+ T lymphocytes are thought to be kept under check by immune regulatory cells such as the invariant Vα14Jα18 TCR α-chain-positive natural T (iNKT) cells (7, 8, 9) either directly or through the mediation of other cell types (e.g., dendritic cells (10) or CD4+DX5+ T lymphocytes (11). NKT cells are a unique subset of T lymphocytes (12, 13, 14, 15, 16), the majority of which express an invariant Vα14Jα18 α-chain preferentially paired with a Vβ8.2 β-chain (13, 17, 18). The CD1d1 tetramer containing a synthetic glycolipid Ag α-galactosylceramide (19) specifically identifies the iNKT cells and hence serves as a powerful tool for tracking this T cell subset (20, 21, 22). The physiological role of iNKT cells, albeit elusive, is thought to be immunoregulatory in nature. Remarkably, in vivo stimulation of iNKT cells through their Ag receptor results in rapid and robust secretion of IL-4 and a spectrum of cytokines characteristic of Th1 and Th2 responses (reviewed in Ref. 23). Consistent with its predicted role in vivo, autoimmune disease-prone mice have very few iNKT cells (24, 25, 26, 27, 28). Thus, NOD mice have less than half the number of iNKT cells compared with C57BL/6 or BALB/c mice (24, 25, 26). NOD iNKT cells secrete little, if any, IL-4 upon in vivo activation (24, 25). This deficiency is complemented in an IL-4- and IL-10-dependent manner by adoptive transfer of CD4−8− thymocytes, which includes iNKT cells, making the young NOD recipients TID resistant (29). Further, increasing the number of endogenous iNKT cells through Vα14Jα18 TCR transgenesis increases IL-4 production by NOD transgenics and protects them from TID (30). Moreover, the absence of NKT cells in NOD.129-CD1d0/0 mice increased TID incidence (9, 31) even in males, which ordinarily have delayed onset and relatively lower disease incidence compared with female NOD mice (9). Together these findings underscore the role of iNKT cells in down-regulating autoimmune responses in vivo. Administration of α-galactosylceramide (α-GalCer), a synthetic CD1d-restricted iNKT cell Ag (19), into prediabetic NOD mice protects them from spontaneous and cyclophosphamide-induced TID (7, 8, 9). This protection appears to require IL-4, which elicits a Th2 response in treated animals (7, 32). Alternatively, IL-4 and CSF-2 elicited by iNKT cells can induce dendritic cell differentiation that promotes Th2-type CD4 responses (10), or iNKT cells can induce tolerance within diabetogenic T lymphocytes (33). Thus, the low numbers of iNKT cells in NOD mice and, consequently, the poor IL-4 response to activation are thought to be TID susceptibility factors in this mouse model. Humans afflicted with TID have low numbers of Vα24Jα18 NKT cells (34), a homologue of mouse Vα14Jα18 T lymphocytes (14, 35, 36, 37, 38). Vα14Jα18 NKT cell clones derived from TID individuals elicit IFN-γ, but not IL-4, upon activation (34). However, Vα24Jα18 NKT cell numbers vary tremendously in both nondiabetics (39, 40) and individuals with TID (39). Further, the robustness of the cytokine response correlated with NKT cell number (39). Thus, the protective role of NKT cells in TID appears controversial. We hypothesized that normal numbers of functional iNKT cells develop in TID-resistant NOD.B10-Idd and B6.NOD-Idd congenics. Thus, using CD1d1-αGalCer tetramers and αGalCer, we tracked iNKT cells and probed their in vivo function in NOD mice. Our data indicate that neither iNKT cell number nor their inability to rapidly secrete IL-4 in response to in vivo activation by Ag underlies the mechanism of protection from TID. Moreover, the regulation of iNKT cell number and function appears to be under the control of genes that map to the Idd4, Idd5, Idd9.1, and Idd13 regions in mice. C57BL/6 (B6), NOD, and NOD.B10-Idd congenics, NOD.B10-Idd3, NOD.B10-Idd5, NOD.B10-Idd9 (R28), NOD.B10-Idd9.2 (R11), NOD.B10-Idd9.3 (R35), and NOD.B10-Idd10,18, were purchased from TaconicFarms (Germantown, NY). NOR/LtJ, B6.NOD.Idd/LtJ (B6.NOD-Idd3, 10, B6.NOD-Idd4, B6.NOD-Idd6, B6.NOD-Idd13) and NOD.NOR-Idd13 congenics were obtained from The Jackson Laboratory (Bar Harbor, ME), whereas NZM2410 and B6.NZM2410-Sle1 were obtained from the University of Florida (Gainesville, FL). B6.129-CD1d10/0 mice have been described previously (41); B6.129-CSF-20/0 mice (42) were a gift from Drs. M. Marino and L. J. Old (three backcross generations to C57BL/6). All mice were bred and maintained at Vanderbilt University Animal Care Division in compliance with Vanderbilt University’s Institutional Animal Care and Use Committee regulations. Abs and reagents for ELISA, cell surface, and intracellular staining were purchased from BD PharMingen (San Diego, CA) unless stated otherwise. The preparation of CD1d1-glycolipid tetramer has been described previously (43). Staining with CD1d1-glycolipid tetramer was performed by incubating 1 million cells on ice for 45 min at a concentration of 10 μg/ml. Each mouse was injected with 10 μg of αGalCer diluted in PBS from a 220 μg/ml stock solution in vehicle (0.5% (v/v) polysorbate-20 and 0.9% (w/v) NaCl) i.v. through the tail vein. Controls were injected with a corresponding dose of vehicle. Ninety minutes later, splenocytes from αGalCer- and vehicle-treated mice were harvested and immediately incubated in tissue culture for 2 h without restimulation with Ag. Supernatants were collected and used to measure IL-2, IL-4, CSF-2, IFN-γ, and TNF-α by sandwich ELISA. ELISA was performed using JES6-1A12, 11B11, R4-6A2 or MP1-22E9 capture Abs and biotinylated JES6-5H4, BVD6-24G2, XMG1.2, or MP1-31G6 Abs for measuring IL-2, IL-4, IFN-γ, or CSF-2, respectively. TNF-α was detected with the DuoSet ELISA development system (R&D Systems, Minneapolis, MN). Pure recombinant cytokines were used to derive a standard curve for each cytokine from which the cytokine response was calculated. Thymocytes of individual, age-matched (6- to 10-wk old) mice were stained for four-color flow cytometric analyses with anti-Vβ8.1,8.2-FITC (MR5–2), anti-CD161 (NKR-P1 or NK1.1)-FITC (PK136), anti-CD24 (heat-stable Ag (HSA))-PE (M1/69), anti-CD8a-PE (53-6.7), anti-TCRβ-PE (H57-597), anti-CD8a-PerCP, and CD1d1-αGalCer-allophycocyanin tetramer. HSAlowCD8low or HSAlow thymocytes were electronically gated, and iNKT cells were analyzed. Splenocytes and hepatic mononuclear cells were stained with anti-Vβ8.1,8.2-FITC, anti-CD161-FITC, anti-CD45R/B220-PE (RA3-6B2), anti-TCRβ-PE, anti-CD45R/B220-PerCP, and CD1d1-αGalCer tetramer after blocking with anti-CD16/CD32 (FcγIII/IIR) (2.4G2). CD45R/B220low cells were electronically gated, and iNKT cells were analyzed. Flow cytometry was performed with FACSCalibur, and the data were analyzed with CellQuest (BD Biosciences, SanJose, CA). Absolute iNKT cell number was calculated from the percentages of the CD1d tetramer-positive cells based on the total cell number obtained from each lymphoid organ (44). Splenocytes from mice treated with αGalCer or vehicle control for 6 h in vivo were stained with anti-pan NK cell-FITC (DX5) and anti-CD3 molecular complex-CyChrome (17A2) after blocking with anti-CD16/CD32 (FcγIII/IIR; 2.4G2). These cells were then stained with anti-IFN-γ-PE (XMG1.2) after fixing and permeabilizing with Cytofix/Cytoperm (BD Pharmingen) solution according to the manufacturer’s protocol. Flow cytometry was performed as described above. To enumerate iNKT cells in vivo and ex vivo, CD1d1-αGalCer tetramers (henceforth, tetramers) were generated. Staining of C57BL/6-derived thymocytes, splenocytes (Fig. 1⇓), and hepatic mononuclear cells (data not shown) revealed a distinct subset of lipid Ag-specific T lymphocytes of high frequency. Predictably, B6.129-CD1d10/0 and B6.129-TCRα0/0 thymus, spleen (Fig. 1⇓), and liver (data not shown) had dramatically fewer, if any, iNKT cells. The ∼0.01% staining of B6.129-CD1d10/0 -derived leukocytes with tetramers was very similar to staining with α-mannosylceramide (αManCer)-containing tetramer (Fig. 1⇓). Note that αManCer is not an iNKT cell Ag (19). Thus, the staining is considered background, and these data establish the specificity of the tetramer reagent. The specificity of CD1d1-αGalCer tetramer. CD1d1-αGalCer tetramer-positive cells in C57BL/6 and B6.129-CD1d10/0 mice were visualized within electronically gated CD8− thymocytes using tetramer-allophycocyanin and anti-CD161-FITC or anti-TCRβ-PE. Similarly, splenic and hepatic iNKT cells were visualized as described above, but within electronically gated B220− splenocytes and CD45+ liver mononuclear cells, respectively. The numbers indicate the percentages of iNKT cells within the total population. Note that the very few tetramer-positive cells observed among B6.129-CD1d10/0 leukocytes were also observed with nonspecific CD1d1-αManCer tetramer. The data shown are representative of numerous experiments using >50 mice. Enumeration of iNKT cells in autoimmune-prone and -resistant mice. Previous studies have demonstrated that several autoimmune-prone mice, including NOD, have decreased numbers of iNKT cells (24, 25, 26, 27, 28). Because of the availability of Idd and Sle congenic strains, NOD, NOR, NZM2410, and B6.NZM-Sle1 mice were analyzed for iNKT cell content and function. NOR is a diabetes-resistant relative of NOD generated from a cross between NOD and C57BLKS mice (45). It carries ∼87% of the NOD genome, including the dominant Idd1 region. The remaining ∼13% of the NOR genome is contributed by C57BLKS (Fig. 2⇓) (46). Because the low number of iNKT cells in NOD is thought to be an important factor in the development of TID, tetramers were used to enumerate this subset in C57BL/6, NOD, and NOR mice. As expected, iNKT cell number in NOD thymus, spleen, and liver was about one-third to one-half that in C57BL/6 lymphoid organs (Fig. 3⇓, A and B). Surprisingly, however, thymic, splenic, and hepatic iNKT cell numbers in NOR were similar to those in NOD; NOR mice had about one-third to one-half the NKT cell content of C57BL/6 mice (Fig. 3⇓, A and B). In contrast to NOD and NOR, lupus-prone NZM2410 and B6.NZM-Sle1 mice, a congenic strain carrying a disease-susceptible region, have very high numbers of hepatic iNKT cells compared with C57BL/6 animals (Fig. 3⇓, C and D). In fact, the absolute hepatic NKT cell number in NZM2410 was 5-fold higher than that of C57BL/6 mice (Fig. 3⇓D). Thus, resistance to autoimmunity does not correlate with iNKT cell number. Schematic rendition of the mouse chromosome illustrates the locations of Idd regions and the genes of immunological import that map to them. ▦, C57BLKS-derived chromosomal segments introgressed into NOD, which resulted in NOR; □, individual Idd regions identified as TID susceptibility genes in NOD. The tentative locations of genes within the mouse chromosomes were based on extensive searches of The Jackson Laboratory’s Mouse Genome Informatics site (http://www.informatics.jax.org/). Enumeration and functional status of iNKT cells in TID-resistant NOR and autoimmune-prone NOD and NZM2410 mice. A, Thymic, splenic, and hepatic iNKT cells of C57BL/6, NOD, and NOR mice were visualized by double staining mononuclear cells from these lymphoid organs with anti-TCRVβ8.1,8.2-FITC and tetramer-allophycocyanin. HSAlowCD8low thymocytes, B220 splenocytes, or CD45+ liver mononuclear cells were electronically gated before detection of iNKT cells. The numbers indicate the percentages of iNKT cells within the total population. The data are representative of two experiments (n = 6). B, Absolute numbers of thymic, splenic, and hepatic iNKT cells in C57BL/6, NOD, and NOR mice were computed as described in Materials and Methods (n = 6). C, Thymic, splenic, and hepatic iNKT cells of three C57BL/6, NZM2410, and B6.NZM-Sle1 mice were identified essentially as described in A (n = 3). Because NZM2410 mice do not express the NK1.1 (CD161, NKR-P1) detected by PK136 mAb, DX5 was used as a surrogate marker in this experiment. D, Absolute numbers of thymic, splenic, and hepatic iNKT cells in C57BL/6, NZM2410, and B6.NZM-Sle1 mice (n = 3). E, αGalCer-induced acute in vivo cytokine response by iNKT cells. Mice were injected i.v. with control vehicle or αGalCer. After 90 min, splenocytes were maintained in tissue culture for 2 h. Cytokines elicited during this period were monitored by ELISA. Background cytokine levels observed in vehicle-treated mice were subtracted from the αGalCer-induced response. The specific cytokine is plotted against the average number of splenic iNKT cells determined in B (middle panel). Note that the splenocytes in tissue culture were not restimulated in vitro with Ag. The data are the average of four experiments (n = 10). F, Acute serum cytokine response of C57BL/6, NZM2410, and B6.NZM-Sle1 following 90 min in vivo activation of NKT cells with αGalCer (n = 3). G, Trans-activation of NK cells by αGalCer-activated iNKT cells. Mice were injected αGalCer i.v. ; after 6 h splenocytes were stained with DX5-FITC, CD3-CyChrome, and IFN-γ-PE. Cells were electronically gated in the DX5+ CD3− population (left column), and their intracellular IFN-γ production was measured in response to vehicle (middle column) or αGalCer (right column) treatment. Numbers within the dot plot refer to the percentage of DX5+ CD3− NK cells eliciting IFN-γ, and the numbers outside the plot indicate the mean fluorescence intensity (MFI). The data shown are representative of two experiments (n = 4). iNKT cell function in NOR mice. A hallmark of iNKT cell function is its ability to rapidly elicit a robust IL-4 response to in vivo activation by Ag (reviewed in Ref. 23). However, NOD’s iNKT cells elicit poorly, if at all, an IL-4 response upon in vivo Ag stimulation (Fig. 3⇑E). It is possible that despite the low number of NKT cells in NOR, they elicit a robust cytokine response to in vivo activation by Ag. Therefore, to test this possibility, the αGalCer-induced response of iNKT cells in disease-resistant NOR was studied along with C57BL/6 as a positive and NOD as a negative control. Ninety minutes after a single i.v. injection of αGalCer, IL-2 as well as both proinflammatory cytokine (IFN-γ, CSF-2, and TNF-α) and IL-4 responses were monitored in tissue culture supernatants following in vitro culture for 2 h. To analyze the results quantitatively, the amount of cytokine secreted was plotted against the splenic iNKT cell numbers shown in Fig. 3⇑B. A diagonal was set from zero at the abscissa and the ordinate to the level of cytokine production in activated C57BL/6 splenocytes. The values above and below the diagonal indicate average cytokine response less or greater than, respectively, that of the C57BL/6 positive control on a per cell basis. As expected, C57BL/6 splenocytes elicited robust proinflammatory cytokine and IL-4 responses within 2 h of culture in vitro (Fig. 3⇑E). Under similar conditions, NOD and NOR elicited little, if any, IL-2 and IL-4 (Fig. 3⇑E). However, unlike NOD, IFN-γ and CSF-2 responses were lower in NOR (Fig. 3⇑E). TNF-α responses were near equal on a per cell basis in all three strains of mice (Fig. 3⇑E). Interestingly, consistent with their high numbers, iNKT cells elicited higher amounts of cytokines in NZM2410 and B6.NZM-Sle1 compared with C57BL/6 mice (Fig. 3⇑F). Thus, both TID-resistant NOR and TID-susceptible NOD mice are defective in eliciting acute IL-2 and IL-4 responses to αGalCer stimulation in vivo. Further, it is apparent that the genetic background of the mouse studied strongly influences iNKT cell number and function. trans-Activation of NK cells by αGalCer-stimulated NKT cells is intact in NOR mice. In vivo Ag-activated iNKT cells can trans-activate NK cells to secrete IFN-γ (47). To determine the status of the trans-activation function of iNKT cells in NOD and NOR, we injected mice with αGalCer or vehicle control and monitored intracellular IFN-γ within splenic NK cells 6 h later. Stimulation of iNKT cells in vivo with αGalCer resulted in an IFN-γ response in NK cells (Fig. 3⇑G). This response of NK cells was absent in B6.129-CD1d10/0 mice (data not shown), which develop NK cells, but not NKT cells (48). Of further note, CD3+ DX5+ and CD3+ DX5− cells produced very little, if any, IFN-γ during the 6 h of αGalCer stimulation in vivo (data not shown). Interestingly, however, the IFN-γ response of NK cells did not correlate with iNKT cell number, because NOR mice, which have about the same number of NKT cells as NOD mice, activated similar numbers of NK cells as C57BL/6 (Fig. 3⇑G). Thus, the trans-activation function of iNKT cells was restored in NOR mice. Enumeration of iNKT cells in Idd9 congenic and subcongenic mice. NOR contains Idd4, Idd5, Idd9/11, and Idd13 from C57BLKS (Fig. 2⇑) (46). Because each Idd region contains numerous genes, the ability of in vivo activated iNKT cells to trans-activate NK cells could be the result of both positive and negative influences imparted by products of genes within Idd4, Idd5, Idd9/11, and/or Idd13. Therefore, we systematically determined iNKT cell numbers in the available NOD.B10-Idd congenics, which included NOD.B10-Idd3, NOD.B10-Idd5, NOD.B10-Idd9, and NOD.B10-Idd10,18. These congenics have individual Idd regions introgressed from the resistant strain into NOD mice. The data revealed that NOD.B10-Idd9, but not NOD.B10-Idd3, NOD.B10-Idd5, and NOD.B10-Idd10,18, had slightly increased numbers of iNKT cells that reacted with the tetramers compared with those in NOD mice (Fig. 4⇓, A–D). NOD.B10-Idd9 thymus and spleen had iNKT cells that constitute ∼60–70% of those in C57BL/6 (Fig. 4⇓, C and D). Additionally, thymic and splenic iNKT cell numbers in NOD.B10-Idd9 were 50–70% greater than those in NOD mice (Fig. 4⇓, C and D). In contrast, hepatic NKT cell numbers in NOD and NOD congenics were almost the same and were about one-fourth of that found in C57BL/6 mice (Fig. 4⇓, A–D). Enumeration and functional characterization of iNKT cells in NOD.B10-Idd congenic mice. A, Visualization of iNKT cells in the lymphoid organs of NOD.B10-Idd9 mice (see Fig. 3⇑A). The data shown are representative of two experiments (n = 4). B, Absolute numbers of iNKT cells in lymphoid organs of C57BL/6, NOD, and NOD.B10-Idd9 mice (see Fig. 3⇑B). Averages were derived from two experiments (n = 4). C, iNKT cells in NOD. B10-Idd9 subcongenic mice were visualized as described in Fig. 3⇑A. The data shown are representative of three experiments (n = 8). D, Absolute numbers of iNKT cells of C57BL/6, NOD, NOD. B10-Idd9 (R28), NOD. B10-Idd9.2, Idd9.3 (R11), and NOD.B10-Idd9.3 (R35) mice (see Fig. 3⇑B). Averages of the absolute numbers were derived from three experiments (n = 8). p = 0.004 for the difference between R28 and C57BL/6 thymic NKT cells; p = 0.009 for the difference between R28 and NOD thymic NKT cells; p = 0.085 for the difference between R28 and C57BL/6 splenic NKT cells; p = 0.127 for the difference between R28 and C57BL/6 splenic NKT cells. E, The acute cytokine response to 90-min in vivo stimulation of NKT cells with αGalCer was determined (see Fig. 3⇑E). 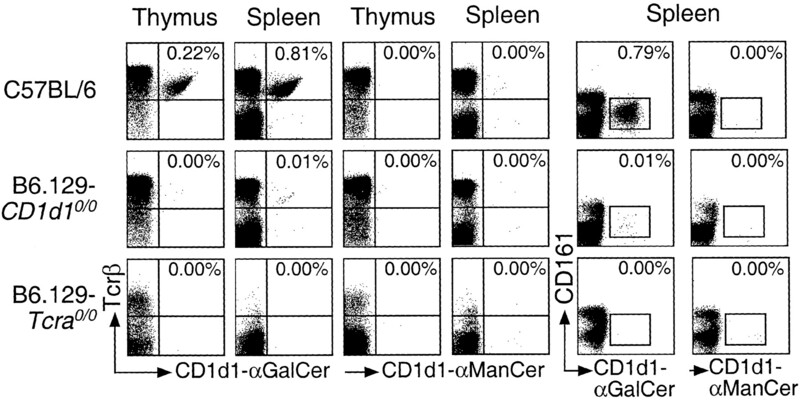 The averages of specific cytokine responses from five experiments using 11 mice are plotted against the average number of splenic iNKT cells represented in D (middle panel). F, Trans-activation of NK cells by αGalCer-activated iNKT cells was measured as described in Fig. 3⇑G. The data shown are representative of three experiments (n = 3). Genetic linkage studies have identified three subregions within Idd9: Idd9.1, Idd9.2, and Idd9.3 (49). To determine the genetic subregion responsible for the increase in iNKT cell number, NOD.B10-Idd9 subcongenics, which included strains R35 and R11 that encompass Idd9.3 alone and Idd9.2 and Idd9.3, respectively, were analyzed (49). As described above, the congenic strain R28 carried slightly increased numbers of iNKT cells, whereas the subcongenic strains R11 and R35 had similar numbers of this T lymphocyte subset; they were similar in number to those in NOD mice (Fig. 4⇑, C and D). Thus, the homeostatic maintenance of iNKT cell number maps to the Idd9.1 subregion. iNKT cells of Idd9 congenic and subcongenic mice respond poorly to αGalCer stimulation. The finding that NOD.B10-Idd9 animals have slightly higher numbers of iNKT cells raised the question of whether the functions attributed to this T lymphocyte subset were restored. Thus, we determined the acute cytokine response of iNKT cells as described above. C57BL/6 splenocytes elicited a robust proinflammatory cytokine IL-4 responses within 2 h of culture in vitro following in vivo activation by Ag. Under similar conditions, NOD and NOD congenics elicited little IL-4 (Fig. 4⇑E and data not shown). However, akin to the positive control, mice of NOD background secreted equal (NOD, R28, and R11) or greater (R35) amounts of IFN-γ and CSF-2 (Fig. 4⇑E). The IL-2 response of NOD background mice was clearly lower than that of C57BL/6 splenocytes, but their TNF-α responses were nearly equal (Fig. 4⇑E). 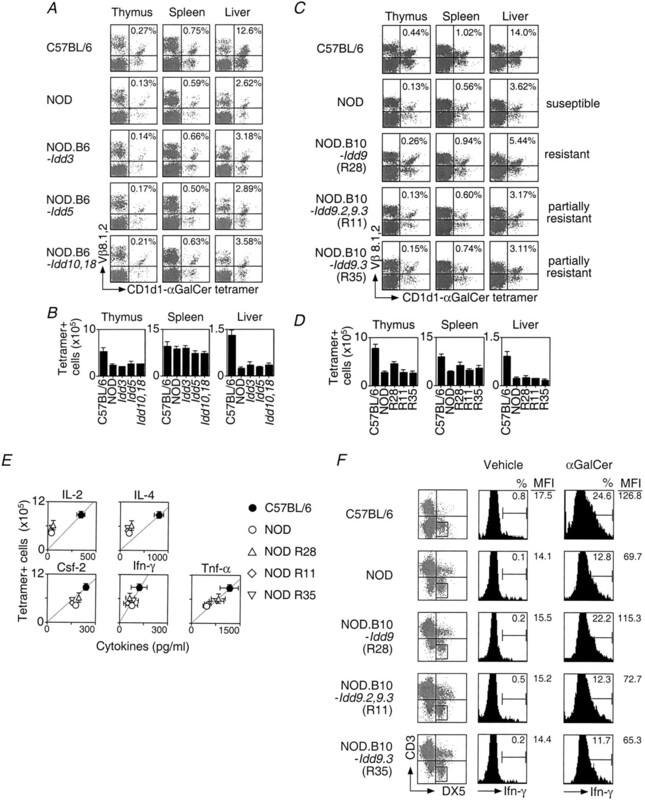 Thus, although the introgression of Idd9 into NOD mice partially restores thymic and splenic iNKT cell number, their acute cytokine response reflects that of the NOD strain background. To determine the roles of genes within the Idd9 region in trans-activation of NK cells by αGalCer-stimulated NKT cells, we monitored intracellular IFN-γ within splenic NK cells 6 h after i.v. injection of αGalCer or vehicle control. The data revealed that the IFN-γ response in NK cells was restored, close to the levels observed in C57BL/6 mice, in R28, which carries the entire Idd9 region, but not in R35 (Idd9.2 and Idd9.3) or R11 (Idd9.3; Fig. 4⇑F). Thus, at least one of the genes that control the trans-activation function of iNKT cells maps to the Idd9.1 subregion. One reason for the lack of association between TID and iNKT cell number and function in the preceding analyses could be due to the influence of multiple dominantly acting negative factors dispersed in the NOD background. In the NOD.B10-Idd congenics, the negative factors may not be overcome by the introgression of an individual Idd region from the resistant strain. Therefore, we reasoned that the introgression of a dominantly acting negative gene(s) into a genetic background that generates normal numbers of functional Vα14Jα18 T cells (e.g., C57BL/6) would result in reduced numbers and/or functionally deficient iNKT cells. To test this possibility, the absolute number and function of iNKT cells were systematically analyzed in B6.NOD-Idd congenics as described in the preceding sections. B6.NOD-Idd3,10, B6.NOD-Idd6, and B6.NOD-Idd13 mice contain near normal numbers of thymic, splenic, and hepatic iNKT cells (Fig. 5⇓, A and B). Further, consistent with the presence of near normal number of Vα14Jα18 T cells, only B6.NOD-Idd6 NKT cells elicited a robust IL-4 response to αGalCer stimulation in vivo like that of the control C57BL/6 animals (Fig. 5⇓C). Surprisingly, unlike the control C57BL/6 animals, B6.NOD-Idd6 mice did not elicit an IFN-γ response to in vivo challenge with the Ag (Fig. 5⇓C). Thus, contrary to what might have been predicted based upon a previous report (50), but consistent with the conclusion of another study (26), we find that NOD alleles within the Idd6 region failed to regulate iNKT cell number and function when introgressed into the C57BL/6 strain background. Enumeration and functional status of iNKT cells in TID-resistant B6.NOD-Idd congenic mice. A, Thymic, splenic, and hepatic iNKT cells were visualized as described in Fig. 3⇑A. The data shown are representative of three experiments (n = 5). B, Absolute numbers of iNKT cells in the indicated lymphoid organs were determined as described in Fig. 3⇑B. Averages were derived from three experiments (n = 5). C, The acute cytokine response to 90-min in vivo stimulation of NKT cells with αGalCer was monitored as described in Fig. 3⇑E. The averages of specific cytokine responses from two experiments using eight or nine mice each are plotted against the average number of splenic iNKT cells represented in B (middle panel). D, trans-Activation of NK cells by αGalCer-activated iNKT cells was measured as described in Fig. 3⇑G. B6.NOD-Idd3,10 and B6.NOD-Idd13, despite carrying close to normal NKT cell content, responded poorly to in vivo stimulation with αGalCer. The two strains showed pronounced defects in acute IL-2, IL-4, IFN-γ, and CSF-2 responses to in vivo activation with αGalCer (Fig. 5⇑C). Strikingly, however, B6.NOD-Idd4, congenic mice have reduced numbers of hepatic iNKT cells despite near normal iNKT cell content within thymus and spleen (Fig. 5⇑, A and B). Consistent with the low hepatic iNKT cell number, the activation of Idd4-derived NKT cells in vivo by αGalCer resulted in a reduced cytokine response in this congenic strain (Fig. 5⇑C). We also observed that the activated iNKT cell-induced trans-activation of NK cells to elicit an IFN-γ response was significantly affected in B6.NOD-Idd13 mice, which closely resembled NOD mice (Fig. 5⇑D). This trans-activation function was lower in B6.NOD-Idd4 and B6.NOD-Idd5 animals, but resembled an intermediate between C57BL/6 and NOD (Fig. 5⇑D). NK cell activation and the IFN-γ response to αGalCer in B6.NOD-Idd3,10 and B6.NOD-Idd6 resembled those in C57BL/6 mice (Fig. 5⇑D). Together these data suggest that genes within Idd4 influence the maintenance and/or hepatic homing of iNKT cell number. Further, one or more genes localized within Idd3/10, Idd4, and Idd13 regions impart a negative effect on iNKT cell function in a mouse strain background-dependent fashion. In summary, our data revealed that neither iNKT cell number nor their inability to rapidly secrete IL-4 in response to in vivo Ag stimulation correlates with resistance to TID (summarized in Table I⇓). Thus, consistent with the recent studies of the role of Vα24Jα18 NKT cells in human autoimmune diabetes (39), iNKT cell deficiency and dysfunction alone cannot explain the NOD strain’s unique susceptibility to spontaneous development of TID. Moreover, we have identified regions within the mouse genome that control iNKT cell ontogeny and function. A gene(s) within the Idd9 region appeared to control iNKT cell number and the NK cell trans-activation function of Ag-activated NKT cells. Using subcongenic strains, these functions were mapped to genes within the 33-cM Idd9.1 subregion (see Fig. 2⇑). Interestingly, Lck and Il14 are among the many known and unknown genes that map to Idd9.1 (49). Lck plays a critical role in normal conventional T and iNKT lymphocyte ontogeny and function (51, 52, 53). Therefore, Lck introgressed into NOD from the C57BL/10 Idd9.1 subregion might in part account for the partial restoration of iNKT cell number and function. The role of IL-14, however, in iNKT cell ontogeny and function is not clear. Several genes of immunological import map within Idd3/10, Idd4, and Idd13 regions (see Fig. 2⇑ and Table I⇑). The currently available mapping data suggest that Idd13 of NOR is C57BLKS derived (46). Because iNKT cell number and function are not very different in NOD and NOR mice, the Idd13 region is less likely to contain genetic information for the development and function of this T cell subset. On the other hand, Idd4 and Idd3/10 regions of NOR are largely of NOD origin (Fig. 2⇑) (46). Previous reports have indicated that mice deficient in IL-2 (44), IL-7 (54), and IL-12a (53) do not alter NKT cell development. On the other hand, IFN regulatory factor-1-deficient (55), CD1d-deficient (41, 48, 56), and β2-microglobulin-deficient (13) mice do not develop NKT cells. Among the remaining genes that map to the Idd4 and Idd13 intervals on chromosomes 11 and 2, respectively, we focused on the putative Idd4 candidate CSF-2 because it was shown to induce the rearrangement and expression of Vα14Jα18 within a putative precursor NKT cell in vitro (57). Analysis of CSF-20/0 thymocytes, splenocytes, and hepatic mononuclear cells with the CD1d1-αGalCer tetramer revealed slightly, but not significantly, reduced iNKT cell number compared with that of lymphoid organs in wild-type littermates (N. Matsuki, A. K. Stanic, and S. Joyce, unpublished observations). Interestingly, the iNKT cells in CSF-20/0 mice responded poorly to in vivo αGalCer stimulation; they elicited very little IL-4 and only weakly trans-activated NK cells to secrete IFN-γ. To determine whether the Idd4 phenotype described herein resulted from aberrant CSF-2 function in NOD mice, B6.NOD-Idd4 mice were crossed with CSF-2+/0 and CSF-20/0 animals. Both crosses rescued the low NKT cell content and poor IL-4 response to αGalCer observed in B6.NOD-Idd4. These data implicate a gene(s) outside the CSF-2 locus, e.g., ICAM-2 and/or CCR9, that may be responsible for the Idd4 phenotype. 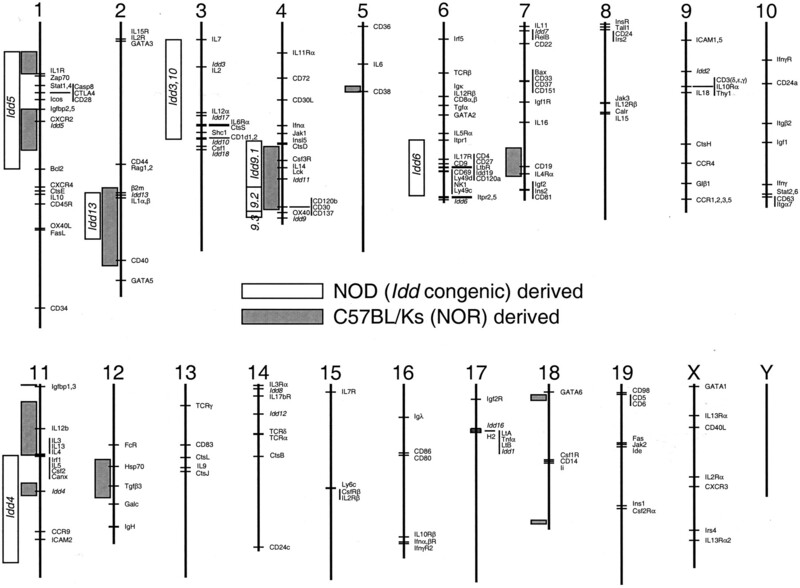 A previous report has shown that the introgression of the C57BL/6 NK locus, which maps to Idd6 and a part of the flanking regions, into NOD conferred resistance to TID. Additionally, the NOD.B6-NK mice had increased iNKT cell numbers, which restored the IL-4-secreting and NK cell trans-activation functions of this T lymphocyte subset (50). Another study, however, reported contrasting results regarding NKT cell number and function in the NOD.B6-NK mice (26). Consistent with the latter report, B6.NOD-Idd6, which also encompasses the NK region, did not have lower iNKT cell number, nor were these T lymphocytes NOD-like in their function (summarized in Table I⇑). The reason(s) for these contrasting results needs further investigation. In conclusion, the data presented herein reveal that neither iNKT cell number nor their inability to rapidly secrete IL-4 in response to in vivo activation by Ag underlies the mechanism of protection from diabetes in NOR and Idd congenic mice. Moreover, the regulation of iNKT cell number and function appears to be under the control of several genes. The most notable of these map to the Idd4, Idd5, Idd9.1, and Idd13 regions of the mouse genome. A gene(s) within the Idd4 region, but outside the CSF-2 locus, controls iNKT cell number and function. Together these findings provide a clue to the genetic mechanism(s) underlying iNKT cell deficiency in NOD mice. We thank Kirin Brewery for the generous supply of αGalCer and αManCer; Drs. M. Marino and L. J. Old for generous supplies of B6.129-CSF-20/0 mice; Dr. E. H. Leiter for the generous supply of NOD.NOR-Idd13 and B6.NOD-Idd/LtJ congenic mice; Drs. O. V. Naidenko and M. Kronenberg for helpful advice on putting together CD1d1-α-galactosylceramide tetramers; and Drs. D. C. Roopenian, D. V. Serreze, and L. Wicker for critical evaluation of the data and helpful discussions. We thank members of the Joyce Laboratory for critical evaluation of the data, comments on the manuscript, and support. ↵1 This work was supported by grants from the National Institutes of Health (AI42284), the Juvenile Diabetes Research Foundation International, and the Human Frontiers in Science Program. ↵3 Abbreviations used in this paper: TID, type I diabetes; αGalCer, α-galactosylceramide; HSA, heat-stable Ag; Idd, insulin-dependent diabetes susceptibility locus; αManCer, α-mannosylceramide; NOD, nonobese diabetic; iNKT, invariant Vα14Jα18 TCR α-chain-positive natural T.
Leiter, E., M. Atkinson. 1998. NOD Mice and Related Strains: Research Applications in Diabetes, AIDS, Cancer and Other Diseases R. G. Landes Company, Austin. Hattori, M., J. B. Buse, R. A. Jackson, L. Glimcher, M. E. Dorf, M. Minami, S. Makino, K. Moriwaki, H. Kuzuya, H. Imura, et al 1986. The NOD mouse: recessive diabetogenic gene in the major histocompatibility complex. Science 231:733. Ikegami, H., G. S. Eisenbarth, M. Hattori. 1990. Major histocompatibility complex-linked diabetogenic gene of the nonobese diabetic mouse: analysis of genomic DNA amplified by the polymerase chain reaction. J. Clin. Invest. 85:18. Prochazka, M., E. H. Leiter, D. V. Serreze, D. L. Coleman. 1987. Three recessive loci required for insulin-dependent diabetes in nonobese diabetic mice. Science 237:286. Wicker, L. S., B. J. Miller, L. Z. Coker, S. E. McNally, S. Scott, Y. Mullen, M. C. Appel. 1987. Genetic control of diabetes and insulitis in the nonobese diabetic (NOD) mouse. J. Exp. Med. 165:1639. Wicker, L. S., J. A. Todd, L. B. Peterson. 1995. Genetic control of autoimmune diabetes in the NOD mouse. Annu. Rev. Immunol. 13:179. Hong, S., M. T. Wilson, I. Serizawa, L. Wu, N. Singh, O. V. Naidenko, T. Miura, T. Haba, D. C. Scherer, J. Wei, et al 2001. The natural killer T-cell ligand α-galactosylceramide prevents autoimmune diabetes in non-obese diabetic mice. Nat. Med. 7:1052. Sharif, S., G. A. Arreaza, P. Zucker, Q. S. Mi, J. Sondhi, O. V. Naidenko, M. Kronenberg, Y. Koezuka, T. L. Delovitch, J. M. Gombert, et al 2001. Activation of natural killer T cells by α-galactosylceramide treatment prevents the onset and recurrence of autoimmune type 1 diabetes. Nat. Med. 7:1057. Wang, B., Y. B. Geng, C. R. Wang. 2001. CD1-restricted NK T cells protect nonobese diabetic mice from developing diabetes. J. Exp. Med. 194:313. Naumov, Y. N., K. S. Bahjat, R. Gausling, R. Abraham, M. A. Exley, Y. Koezuka, S. B. Balk, J. L. Strominger, M. Clare-Salzer, S. B. Wilson. 2001. Activation of CD1d-restricted T cells protects NOD mice from developing diabetes by regulating dendritic cell subsets. Proc. Natl. Acad. Sci. USA 98:13838. Gonzalez, A., I. Andre-Schmutz, C. Carnaud, D. Mathis, C. Benoist. 2001. Damage control, rather than unresponsiveness, effected by protective DX5+ T cells in autoimmune diabetes. Nat. Immunol. 2:1117. Ballas, Z. K., W. Rasmussen. 1990. 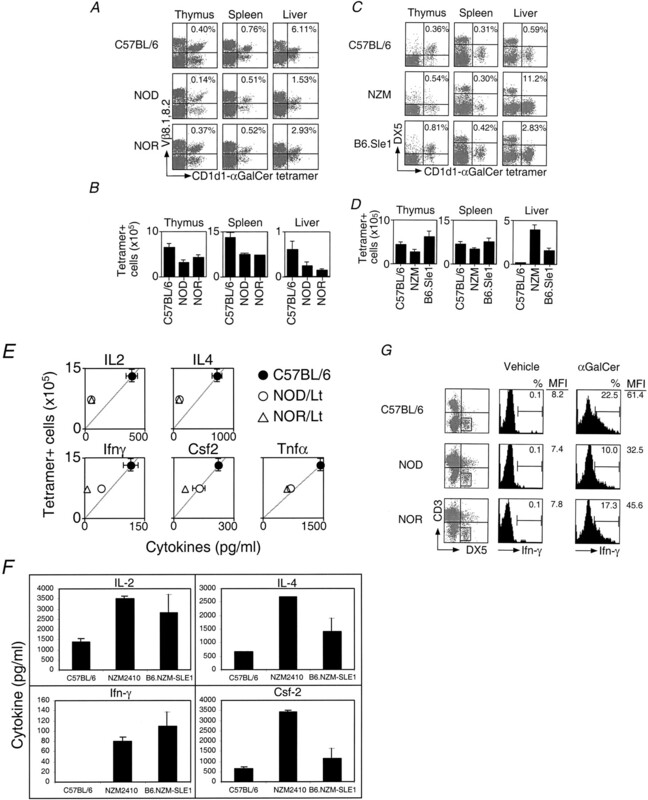 NK1.1+ thymocytes: adult murine CD4−CD8− thymocytes contain an NK1.1+, CD3+, CD5hi, CD44hi, TCR−Vβ8+ subset. J. Immunol. 145:1039. Exley, M., G. Garcia, S. P. Balk, S. Porcelli. 1997. Requirements for CD1d recognition by human invariant Vα24+ CD4−CD8− T cells. J. Exp. Med. 186:109. MacDonald, H. R., R. K. Lees, W. Held. 1998. Developmentally regulated extinction of Ly-49 receptor expression permits maturation and selection of NK1.1+ T cells. J. Exp. Med. 187:2109. Sykes, M.. 1990. Unusual T cell populations in adult bone marrow: prevalence of CD3+CD4−CD8− and αβTCR+ NK1.1+ cells. J. Immunol. 145:3209. Arase, H., N. Arase, K. Agasawara, R. A. Good, K. Onoe. 1992. An NK1.1+ CD4+8− single positive thymocyte subpopulation that expresses a highly skewed T cell antigen receptor family. Proc. Natl. Acad. Sci. USA 89:6506. Lantz, O., A. Bendelac. 1994. An invariant T cell receptor α chain is used by a unique subset of MHC class I specific CD4+ and CD4−8− T cells in mice and humans. J. Exp. Med. 180:1097. Kawano, T., J. Cui, Y. Koezuka, I. Toura, Y. Kaneko, K. Motoki, H. Ueno, R. Nakagawa, H. Sato, E. Kondo, et al 1997. CD1d-restricted and TCR-mediated activation of Vα14 NKT cells by glycosylceramides. Science 278:1626. Benlagha, K., A. Weiss, A. Beavis, L. Teyton, A. Bendelac. 2000. In vivo identification of glycolipid antigen-specific T cells using fluorescent CD1d tetramers. J. Exp. Med. 191:1895. Matsuda, J. L., O. V. Naidenko, L. Gapin, T. Nakayama, M. Taniguchi, C.-R. Wang, Y. Koezuka, M. Kronenberg. 2000. 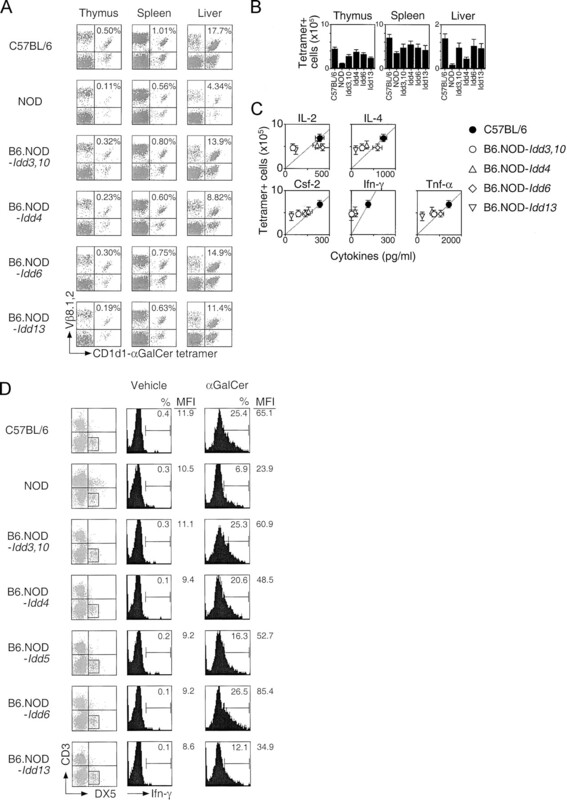 Tracking the response of natural killer T cells to a glycolipid antigen using CD1d tetramers. J. Exp. Med. 192:741. MacDonald, H. R.. 2000. CD1d-glycolipid tetramers: a new tool to monitor natural killer T cells in health and disease. J. Exp. Med. 192:F15. Baxter, A. G., S. J. Kinder, K. J. L. Hammond, R. Scollay, D. I. Godfrey. 1997. Association between αβTCR+CD4−CD8− T-cell deficiency and IDDM in NOD/Lt mice. Diabetes 46:572. Gombert, J. M., A. Herbelin, E. Tancrede-Bohin, M. Dy, C. Carnaud, J. F. Bach. 1996. Early quantitative and functional deficiency of NK1+-like thymocytes in the NOD mice. Eur. J. Immunol. 26:2989. Mieza, M. A., T. Itoh, J. Q. Cui, Y. Makino, T. Kawano, K. Tsuchida, T. Koike, T. Shirai, H. Yagita, A. Matsuzawa, et al 1996. Selective reduction of Vα14+ NK T cells associated with disease development in autoimmune prone mice. J. Immunol. 156:4035. Takeda, K., G. Dennert. 1993. The development of autoimmunity in C57BL/6 lpr mice correlates with the disappearance of the natural killer type 1 positive cells: evidence for their suppressive action on bone marrow stem cell proliferation, B cell immunoglobulin secretion and autoimmune symptoms. J. Exp. Med. 177:155. Hammond, K. J. L., L. D. Poulton, L. Palmisano, P. Silveira, D. I. Godfrey, A. G. Baxter. 1998. α/β-T cell receptor (TCR)+ CD4−CD8− (NKT) thymocytes prevent insulin-dependent diabetes mellitus in non-obese diabetic (NOD)/Lt mice by the influence of interleukin (IL)-4 and/or IL-10. J. Exp. Med. 187:1047. Lehuen, A., O. Lantz, L. Beaudoin, V. Laloux, C. Carnaud, A. Bendelac, J. F. Bach, R. C. Monteiro. 1998. Overexpression of natural killer T cells protects Vα14Ja281 transgenic nonobese diabetic mice against diabetes. J. Exp. Med. 188:1831. Shi, F. D., M. Flodstrom, B. Balasa, S. H. Kim, K. Van Gunst, J. L. Strominger, S. B. Wilson, N. Sarvetnick. 2001. Germ line deletion of the CD1 locus exacerbates diabetes in the NOD mouse. Proc. Natl. Acad. Sci. USA 98:6777. Singh, N., S. Hong, D. C. Scherer, I. Serizawa, N. Burdin, M. Kronenberg, Y. Koezuka, L. Van Kaer. 1999. Activation of NK T cells by CD1d and α-galactosylceramide directs conventional T cells to the acquisition of a Th2 phenotype. J. Immunol. 163:2373. Laloux, V., L. Beaudoin, C. Ronet, A. Lehuen. 2002. Phenotypic and functional differences between NKT cells colonizing splanchnic and peripheral lymph nodes. J. Immunol. 168:3251. Wilson, S. B., S. C. Kent, K. T. Patton, T. Orban, R. A. Jackson, M. Exley, S. Porcelli, D. A. Schatz, M. A. Atkinson, S. P. Balk, et al 1998. Extreme Th1 bias of invariant Vα24JaQ T cells in type 1 diabetes. Nature 391:177. Dellabona, P., E. Padovan, G. Casorati, M. Brockhaus, A. Lanzavecchia. 1994. An invariant Vα24JαQ/Vβ11 T cell receptor is expressed in all individuals by clonally expanded CD4−8− T cells. J. Exp. Med. 180:1171. Gumperz, J. E., S. Miyake, T. Yamamura, M. B. Brenner. 2002. Functionally distinct subsets of CD1d-restricted natural killer T cells revealed by CD1d tetramer staining. J. Exp. Med. 195:625. Lee, P. T., K. Benlagha, L. Teyton, A. Bendelac. 2002. Distinct functional lineages of human Vα24 natural killer T cells. J. Exp. Med. 195:637. Porcelli, S. A., D. Gerdes, A. M. Fertig, S. P. Balk. 1996. Human T cells expressing an invariant Vα24-JaQ TCRα are CD4− and heterogeneous with respect to TCRβ expression. Hum. Immunol. 48:63. Lee, P. T., A. Putnam, K. Benlagha, L. Teyton, P. A. Gottlieb, A. Bendelac. 2002. Testing the NKT cell hypothesis of human IDDM pathogenesis. J. Clin. Invest. 110:793. Motsinger, A., D. W. Haas, A. K. Stanic, L. Van Kaer, S. Joyce, D. Unutmaz. 2002. CD1d-restricted human natural killer T cells are highly susceptible to human immunodeficiency virus 1 infection. J. Exp. Med. 195:869. Wada, H., Y. Noguchi, M. W. Marino, A. R. Dunn, L. J. Old. 1997. T cell functions in granulocyte/macrophage colony-stimulating factor deficient mice. Proc. Natl. Acad. Sci. USA 94:12557. Stanic, A. K., A. D. De Silva, V. Sriram, S. Ichikawa, Y. Hirabayashi, L. Van Kaer, K. Hayakawa, R. R. Brutkiewicz, S. Joyce. 2003. Defective presentation of the CD1d1-restricted natural Vα14Jα18 NKT lymphocyte antigen caused by β-d-glucosylceramide synthase deficiency. Proc. Natl. Acad. Sci. USA 100:1849. Boesteanu, A., A. D. De Silva, H. Nakajima, W. J. Leonard, J. J. Peschon, S. Joyce. 1997. Distinct roles for signals relayed through the common cytokine receptor γ chain and interleukin 7 receptor α chain in natural T cell development. J. Exp. Med. 186:331. Prochazka, M., D. V. Serreze, W. N. Frankel, E. H. Leiter. 1992. NOR/Lt: MHC-matched diabetes-resistant control strain for NOD mice. Diabetes 41:98. Serreze, D. V., M. Prochazka, P. C. Reifsnyder, M. M. Bridgett, E. H. Leiter. 1994. Use of recombinant congenic and congenic strains of NOD mice to identify a new insulin-dependent diabetes resistance gene. J. Exp. Med. 180:1553. Carnaud, C., D. Lee, O. Donnars, S.-H. Park, A. Beavis, Y. Koezuka, A. Bendelac. 1999. Cross-talk between cells of the innate immune system: NKT cells rapidly activate NK cells. J. Immunol. 163:4647. Smiley, S. T., M. H. Kaplan, M. J. Grusby. 1997. Immunoglobulin E production in the absence of interleukin-4 secreting CD1 dependent cells. Science 275:977. Lyons, P. A., W. W. Hancock, P. Denny, C. J. Lord, N. J. Hill, N. Armitage, T. Siegmund, J. A. Todd, M. S. Phillips, J. F. Hess, et al 2000. The NOD Idd9 genetic interval influences the pathogenicity of insulitis and contains molecular variants of Cd30, TNFr2, and Cd137. Immunity 13:107. Carnaud, C., J. Gombert, O. Donnars, H. Garchon, A. Herbelin. 2001. Protection against diabetes and improved NK/NKT cell performance in NOD.NK1.1 mice congenic at the NK complex. J. Immunol. 166:2404. Vicari, A., A. Herbelin, M. d. C. Leite-de-Moraes, U. von Freeden-Jeffry, R. Murray, A. Zlotnik. 1996. NK1.1+ T cells from IL-7-deficient mice have normal distribution and selection but exhibit impaired cytokine production. Int. Immunol. 8:1759. Ohteki, T., H. Yoshida, T. Matsuyama, G. S. Duncan, T. W. Mak, P. S. Ohashi. 1998. The transcription factor interferon regulatory factor 1 (IRF-1) is important during the maturation of natural killer 1.1+ T cell receptor-αβ+ (NK1+ T) cells, natural killer cells, and intestinal intraepithelial T cells. J. Exp. Med. 187:967. Chen, Y.-H., N. M. Chiu, M. Mandal, N. Wang, C.-R. Wang. 1997. Impaired NK1+ T cell development and early IL-4 production in CD1 deficient mice. Immunity 6:459. Sato, H., T. Nakayama, Y. Tanaka, M. Yamashita, Y. Shibata, E. Kondo, Y. Saito, M. Taniguchi. 1999. Induction of differentiation of pre-NKT cells to mature Vα14 NKT cells by granulocyte/macrophage colony-stimulating factor. Proc. Natl. Acad. Sci. USA 96:7439.